New for Office 2011, the Ribbon is like a large, thick toolbar that takes up a fixed area of screen real estate. 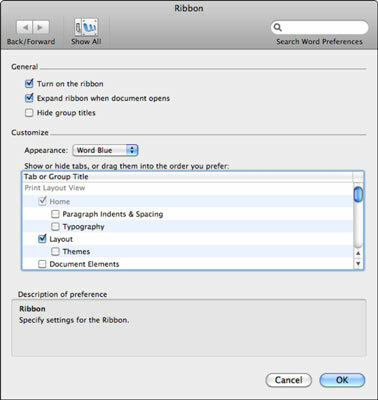 This first iteration of the Ribbon in Office 2011 offers limited customization capabilities. You can customize the Ribbon by clicking the wheel at the right edge of the Ribbon. The Ribbon doesn’t respond to XML, VBA, or other programmatic customizations. When you choose Ribbon Preferences from the menu, a Ribbon dialog opens. Another way to access the same dialog is through [Application Name]→Preferences; then click the Ribbon button. Turn on the Ribbon: When selecting, the Ribbon is on and this is the default setting. To turn the Ribbon off, deselect this setting. Expand Ribbon When Document Opens: When selected, the entire Ribbon is visible when opening a file. When deselected, only the Ribbon tabs are displayed when a document opens. If you choose this option and then want to see the entire expanded Ribbon, just click any of the Ribbon tabs visible. Hide Group Titles: This turns off the display of group names in the Ribbon tabs, which may give you a little more screen estate. Appearance: Choose between either the application theme or graphite. The application theme is different for each Office 2011 application. In Word 2011, it’s called Word Blue. Show or Hide Tabs, or Drag Them into the Order You Prefer: Select or deselect tabs and groups. Drag items in this box to re-order the Ribbon. Description: As you move your mouse over command buttons and controls, a description dynamically appears in the panel. In addition to using the Ribbon preferences, you can choose the Customize Ribbon Tab Order option from the pop-up menu. This option temporarily changes the appearance of the tabs and allows you to drag Ribbon tabs to change their order. Click the Done button when you’re done rearranging the tabs. If you made changes that you don’t like, click the Reset button to set the tab order to default.